Ketones are the cleanest, most powerful and beneficial energy source for your body, because they feed off your own body fat. This promotes healthy weight loss, while at the same time boosting your energy levels! You can finally support your body’s metabolism and thermogenesis (the ability to burn fat) with our advanced and efficient, patented ketosis technology. Not only will Kegenix™ PRIME put your body into a state of ketosis in under 60 minutes, it will also promote healthy brain function, better clarity, and reduce inflammation and brain fog. 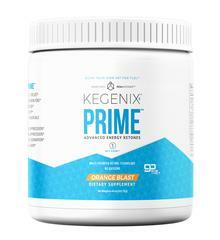 Ideal for both men and women, Kegenix™ PRIME is a dynamic and powerful ketosis dietary supplement that will assist weight loss, promote abdominal fat burn, and support better digestion and sleep. Suggested use: Mix 1 scoop into 12-16 fluid ounces of chilled water according to taste preference. Stir or shake accordingly. Can be taken without food.